DURHAM, N.C. -- Zion Williamson had 27 points and 16 rebounds, and No. 4 Duke pulled away to beat Army 94-72 on Sunday. 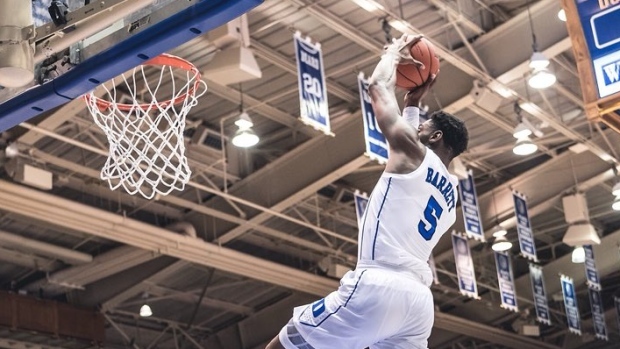 Cameron Reddish finished with 25 points and a third freshman -- RJ Barrett -- had 23 while Williamson added six blocked shots and four assists for the Blue Devils (2-0). Playing five days after routing No. 2 Kentucky in the Champions Classic , they shot 49 per cent but couldn't shake the Black Knights until the final 10 minutes, finally pulling away with an 11-0 run keyed by 3-pointers from Barrett and Reddish. Matt Wilson scored 15 points and Tommy Funk added 10 for Army (1-1), and Funk hit back-to-back 3s to pull the Black Knights to 67-61 with just over 12 minutes left. Reddish hit a driving layup, and he and Barrett each hit 3s on consecutive possessions to push the lead into double figures for good. Reddish added another 3 to stretch the lead to 78-61 with just over 9 minutes left, and the Blue Devils eventually went up by 20 on Williamson's stickback with less than 4 minutes to play. Army: Plenty to build on for the Black Knights, who proved themselves as much more than just a sentimental Veterans Day choice for Duke and Hall of Fame coach Mike Krzyzewski, a former Black Knight player and coach himself. Not only did they not back down against a preseason Final Four favourite, they gave Duke more of a test than Kentucky did. That will pay off once conference play begins. Duke: As dominant as the Blue Devils looked against Kentucky, they looked equally vulnerable during stretches of this one, perhaps proving that college basketball won't be as easy for these freshmen as they made it look in the Champions Classic. It wound up being another blowout, but there were plenty of teachable moments for Krzyzewski: Duke left far too many perimeter shooters open and too often settled for low-percentage shots -- the 36 3-pointers attempted were its most since 2016. Army: Plays host to Sacred Heart on Friday. Duke: Plays host to Eastern Michigan on Wednesday night.